The French have crepes, Americans have pancakes, and the Austrians and Bavarians have schmarrn (pancake in small pieces). Schmarrn is made in both sweet and savory varieties usually with eggs and a starch, cooked in butter and pulled apart to finish browning. 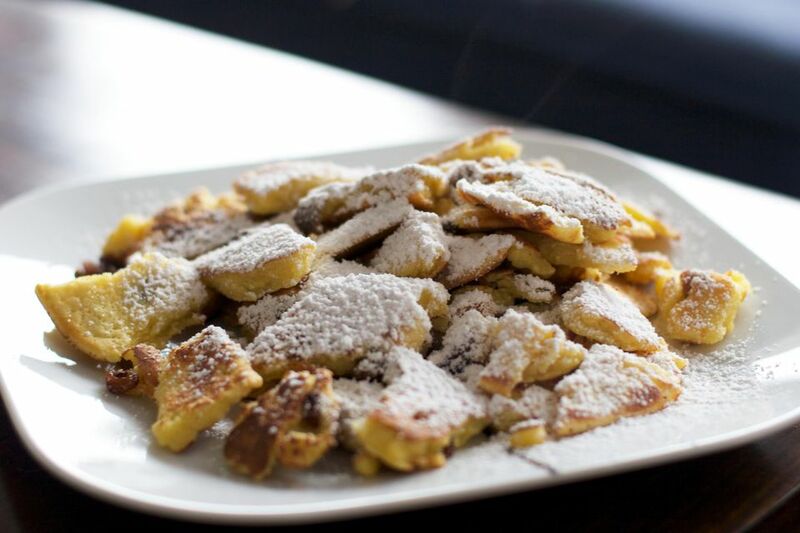 This recipe is enriched with raisins, rum, and sugar and known as kaiserschmarrn. Austria is known for its cafes and its many kinds of coffee. Place the raisins in a small bowl and pour the rum over. Microwave the rum and raisin mix for 15 to 30 seconds and let them soak until the rum is absorbed, about 20 minutes. Set aside. In a medium bowl, beat the egg whites to soft peaks, adding a pinch of salt toward the end. In a separate large bowl, beat the egg yolks, vanilla, optional lemon zest, and sugar until the mixture is light yellow. Add the milk and flour, a little at a time to avoid lumps, and blend well. Fold in the egg whites and let the batter rest for about 10 minutes. Melt 1 to 2 tablespoons of butter in a 10- to 12-inch frying pan. Stir the batter again gently and pour it into the hot pan. Sprinkle the raisins evenly over the top. Cover the pan and let the pancake cook for 10 minutes over medium heat. Flip over and cook about 10 minutes more; you might have to cut it into several portions to flip. Cut or pull the pancake apart into bite-size pieces while it continues to cook. When it is browned a bit, it is ready to serve. Sprinkle with confectioners' sugar and serve with applesauce or preserves of your choice. If you like a chewier consistency, let the pancake cool down a bit.